If you asked people their top reasons for having a baby, there will always be at least one parent who says, “to dress him in ridiculously cute outfits.” For that parent, and every parent who appreciates a bit of the ridiculously cute, there’s the Star Baby Snuggle Suit. 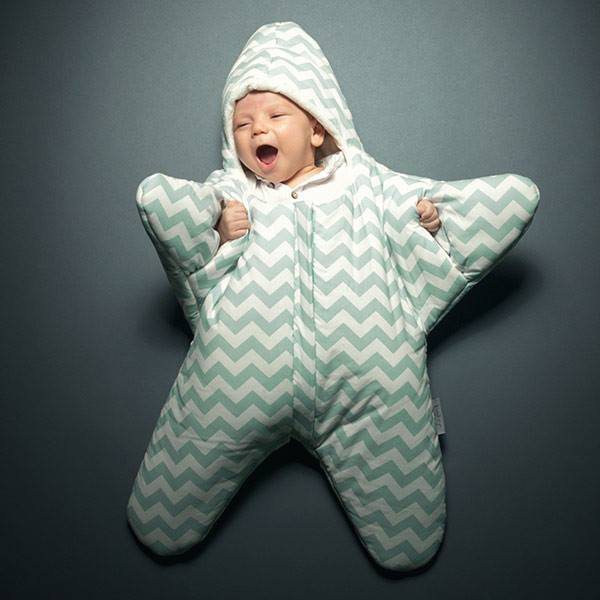 From the good people who brought us the Baby Bites shark and orca sleeping bags, the Star Baby Snuggle Suit ($149.95) is a little less hilarious, but is still super cute and warm. The snuggle suit comes in cream with spots, or blue or pink chevrons. It’s got a hood and mitts, and is padded like a camping sleeping bag, which makes it perfect for pram outings in the winter. If you’ve ever had to bend your baby awkwardly into a snowsuit, you’ll appreciate that the front zip and wide silhouette of the Star Snuggle Suit means it’s easy to get babies in and out, even if they’re positively puffy with layers of underclothes. The Star Baby Snuggle Suit is available locally from The Gathered Store and ships for $9.95.